In this modern-day-take-it-out-of-the-freezer-and shove-it-in-the-microwave world, we often lose sight of what real food tastes like. Not too surprising, when you look at the ingredient lists on most prepared foods. I figure if you can’t even pronounce half the ingredients, you shouldn’t rely on it as a major food source. Many so-called foods have more chemicals than food ingredients. Just think about beef stew or chili simmering slowly through the day, ready to warm the cockles of your heart – not to mention your cold hands – come dinner time. Or home-made breakfast burritos or Cornish pasties, stored in the freezer for those mornings when you can barely find the kitchen, let alone think up a menu. I grew up in a family where poached eggs meant store-bought, anemic ovoids dropped into rapidly boiling water with a little salt. 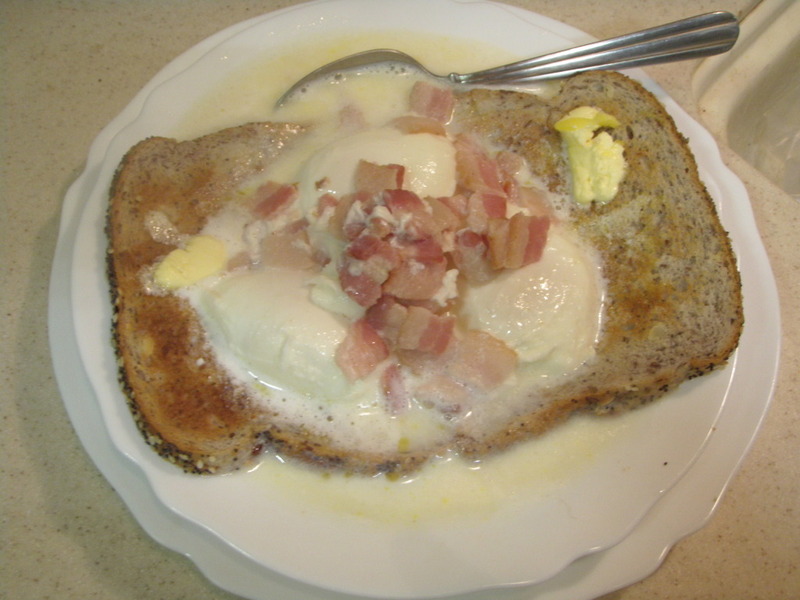 Not until I married did I learn about real poached eggs, as made by my husband, a recipe handed down by his mother. Her poached eggs are comfort food at its best. Although you can achieve a reasonable facsimile with store-bought ingredients, really wonderful gastronomic excellence is the result of fresh eggs from your own chickens, raw milk (I’ll back Maybelle the milk cow against all contenders), bacon from the pigs you raised yourself, homemade bread and butter… I’m sure you get the picture. On a day when there’s a couple of inches of snow on the ground and more falling every minute, with a temperature of 28 degrees, this is a breakfast of champions. 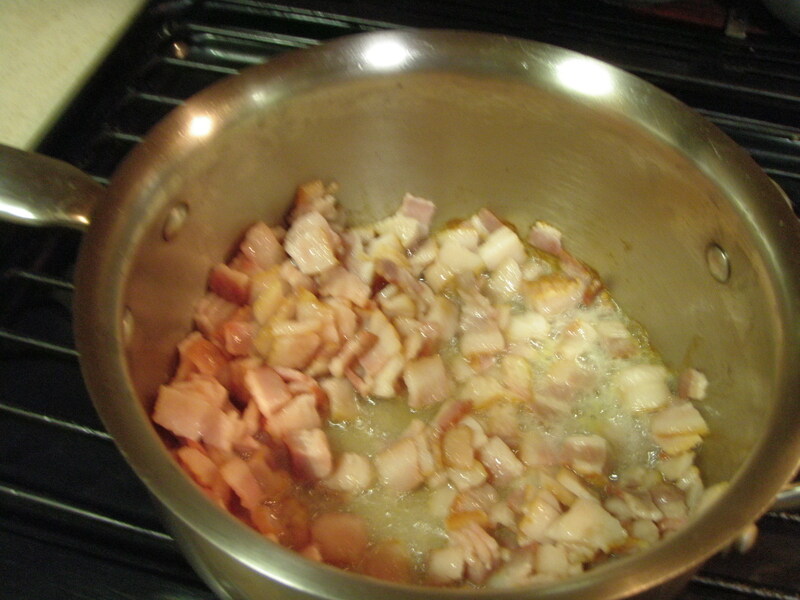 A package of diced bacon ends (the trimmings from bacon, pieces that are too small to be regular slices); if you only have sliced bacon use 3 or 4 slices, finely diced. Cook the bacon and onion in a heavy cast iron skillet on medium-high heat until the bacon is crisp and the onion softens, about 5 minutes. Pour in the milk and heat just to the boiling point. While the milk is heating, crack the eggs into a bowl or measuring cup. 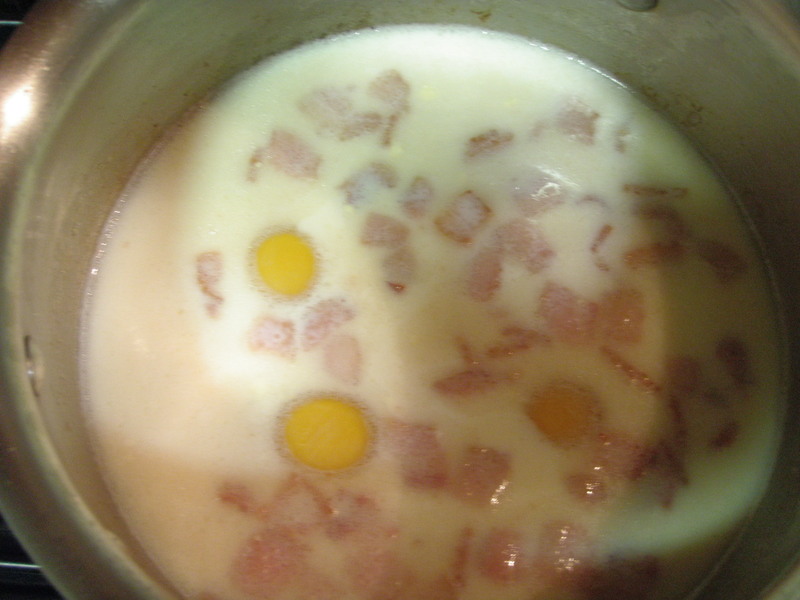 When the milk just begins to boil, pour in eggs and turn heat down to low. Cover and cook about 5-7 minutes — the longer time for more servings. 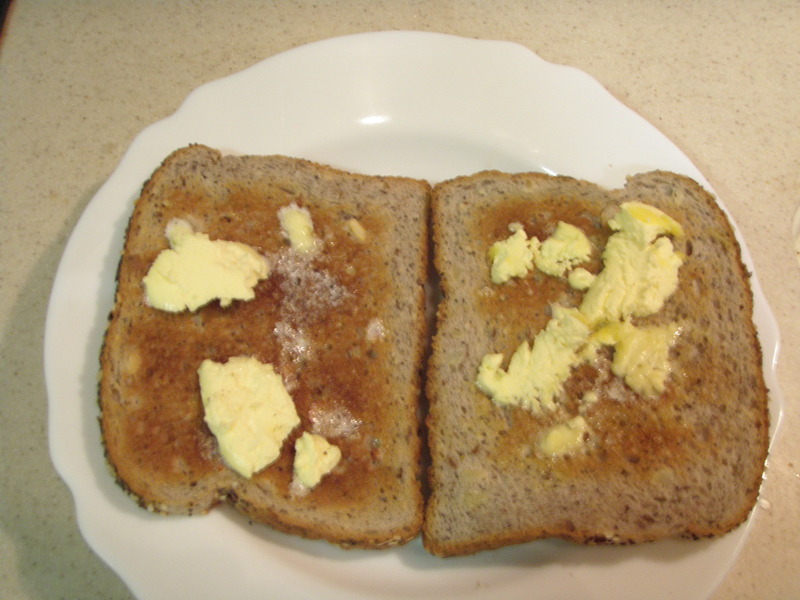 Start toasting and buttering bread about 1 minute before the eggs should be done. 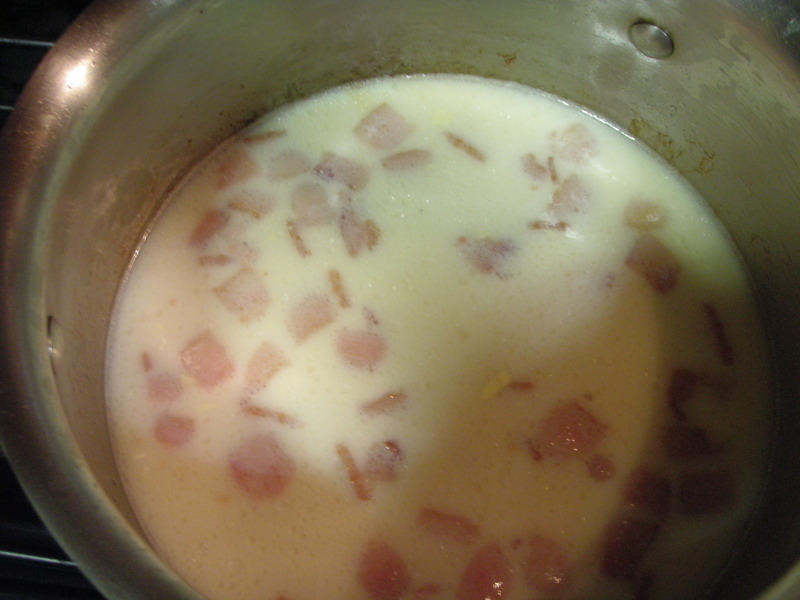 Place toast in a shallow bowl, spoon in eggs plus milk/bacon/onions and sprinkle with chopped celery leaves or parsley. If you want to add garlic, sprinkle it into the pan about the time you start the toast (for real poached egg with garlic aficionados, you can sprinkle the garlic over the toast and pour the eggs on top). You can add as many as a dozen eggs to this recipe without increasing the milk. 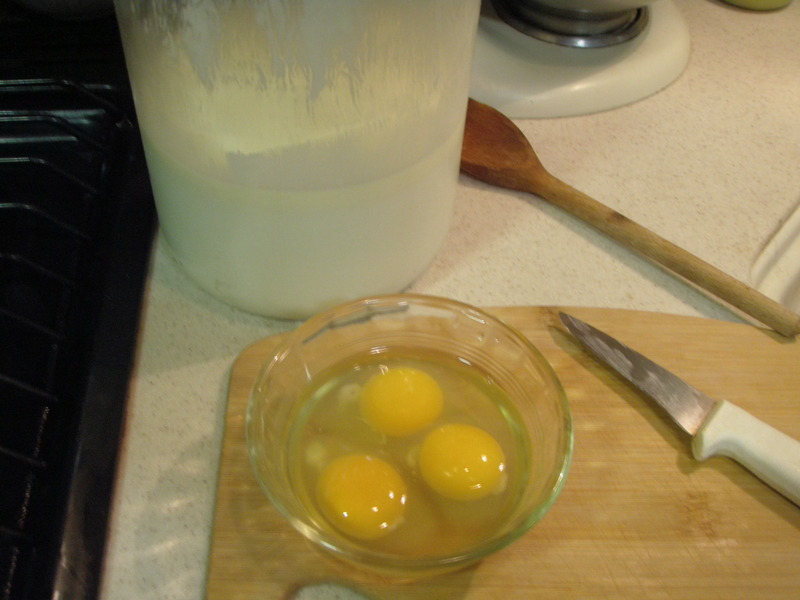 After that, add about ½ cup milk per 3 eggs. This entry was posted in Farms, Food, Recipes and tagged bacon, butter, eggs, milk, milk cow, poached eggs, toast. Bookmark the permalink.